the following post will try to explain how I’ve processed this image in Photoshop CS4; I’m writing this article for two reason: first of all I hope it’ll be usefull for somebody and second I’ll be happy to know your opinion about what I’ve done in this picture. The method is useful for landscapes images where there’s a strong difference between the grass and the sky. Both parts should be differently exposed and we know that it’s difficult to achieve a good result with just one shot. The good old tripod should be a must have accessory for this kind of photos but (like in my case) many times we don’t bring this friend with us so we have to take two handheld pictures; the result is that our two shoots will not be identical. Maybe the “Bracketing” function available on your digital SLR will help you in taking two similar pictures (not identical) but during the next Photoshop’s union the images will not overlap. Moreover, using the Bracketing you can’t have a good control over the exposure, while – if you take two singular shot – you’ll have a bette exposure control of both image’s zones. 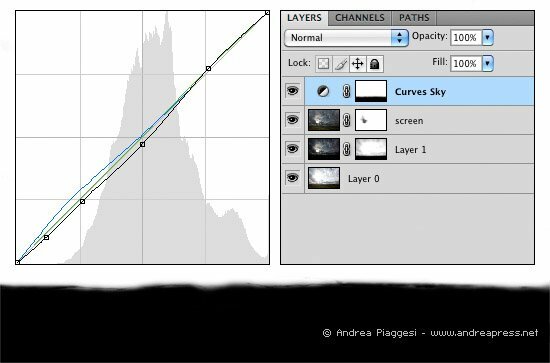 Now we have to use the “Auto-Align Layers” function available on Photoshop, but we need both shots in two layers to activate it, so we have to copy one of them into the other (I’ve copied the one well exposed for the sky over the other one). 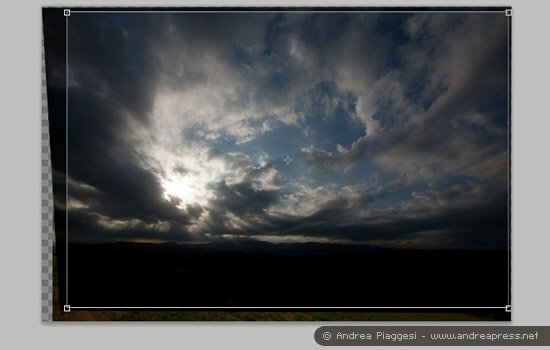 Fron now I’ll call the image correctly exposed for the sky as “sky exposure” and the one correcly exposed for the grass as “grass exposure”. 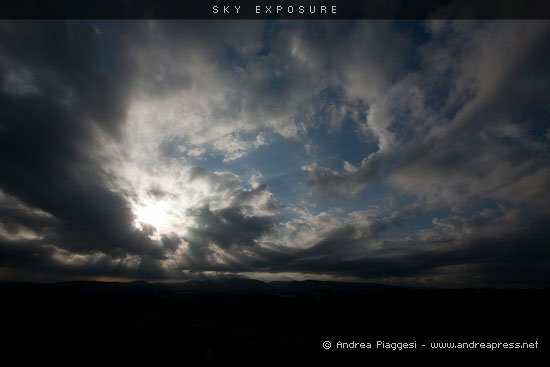 Now we’ll work on this image, so we can close the sky exposure already copied. 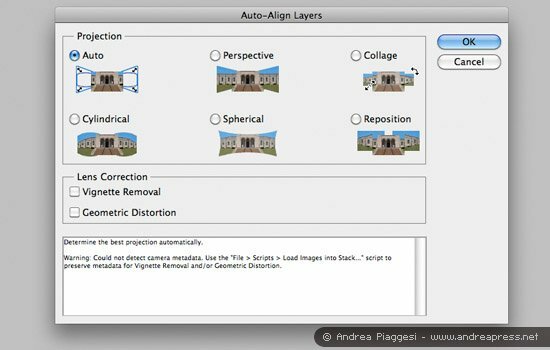 Select both levels (CMD on a Mac / CTRL on a PC + Click) and activate the dedicated function by clicking on Edit → Auto-Align Layers. It’ll open a mask with many projection options, leave the default “Auto” selected and confirm the operation with ok.
Good, now both exposure should be perfectly aligned! We have only to remove the border where the two pictures aren’t aligned, so select the crop tool and crop the picture. 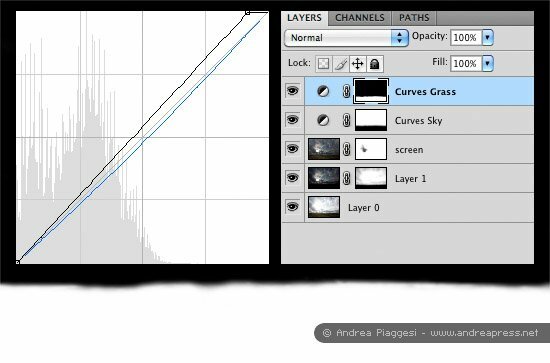 Now we have to merge both layers: I’ll mask the grass in the upper layer to reveal the bottom one where we have the same zone correctly exposed; so add a layer mask to the upper layer (Layer → Layer Mask → Reveal All) and with the black brush paint over the grass to hide it. This operation will both exclude partially the masked layer and reveal the bottom one, in other word the grass will be much more brighter than how it was before. 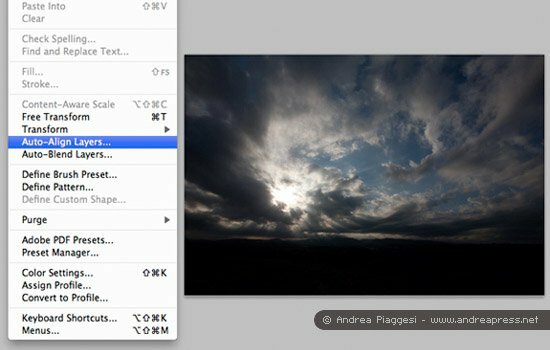 I suggest you to use a variable opacity brush (from 10% to 30%) to achieve a smooth transaction on the horizon. 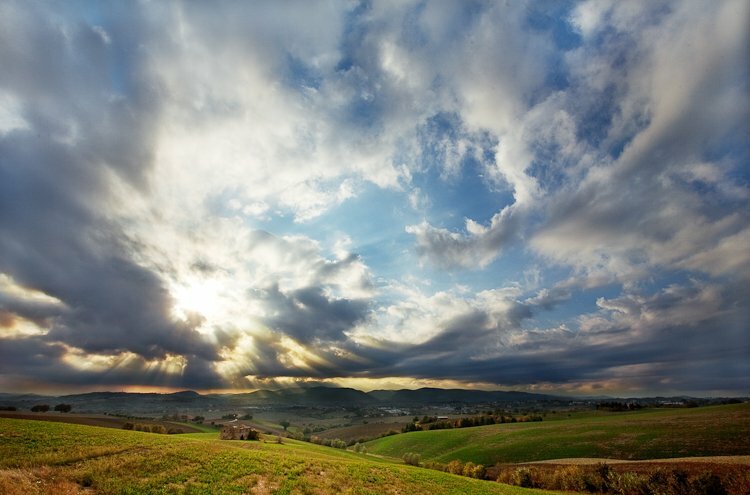 If the sky is too dark, we can adjust the opacity of the upper layer to make it brighter. Please move the mouse over the image to see the layer mask. 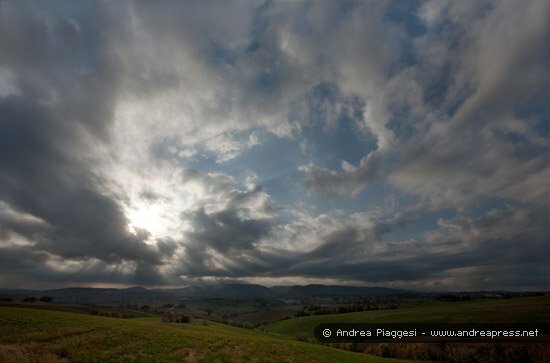 So, if you start from two good exposures, your picture should already have a good balance but, in my case, the grass exposure was a little bit darker (not completely black like in the sky exposure), so the actual merge need more light. 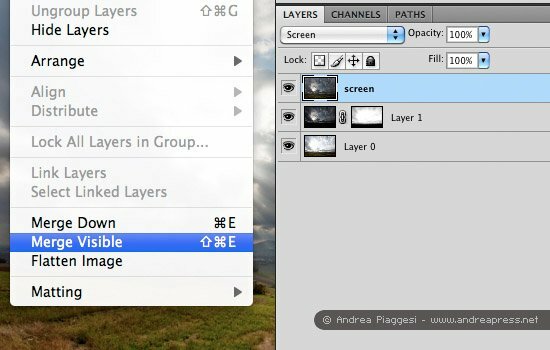 Select this level and change it’s “Blend Mode” to Screen (below there’s a screenshot of the layer list, the new one has been renamed to “screen”). The image will be brighter; to keep the details intacted in the area around the sun, I’ve added a layer mask to the “screen” level too. (You have only to paint with the black brush over the little zone around the sun). Please move the mouse over the image to see the mask. Ok, we’ve just finished the merging of the two images, the next steps involve layer and curves that I’ve applied to improve different parts of the photo. The following curve has been applied to the sky to enhance its intensity and color saturation; as usual, I’ve adjusted the effect of this layer by applying the mask visible on the background (on the right you can see the layers you have created until now). Following, you can see the image before and after the curve was applied, the final effect is light (especially in image of this size) but it is visible anyway. Move the mouse over the image to see how it was before the curve application. I’ve made another adjustment layer to achieve a better grass tone and luminosity; below I show the curve and the mask I used to limit the layer effect. On the right you can see the actual layer situation. 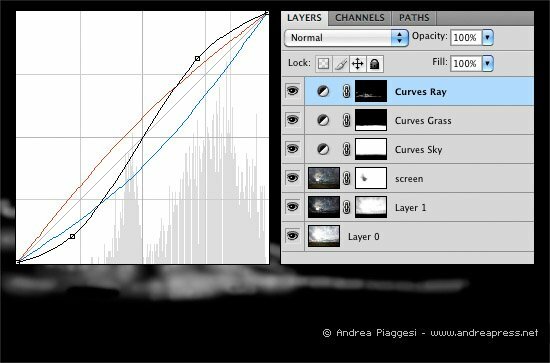 The next picture shows the effect of the last curve (move the mouse over the picture to see it without the curve application). Ok, probably you’re tired of reading this post, so I’ll add just another layer: I want a stronger contrast and warmer colors on the sunbeams. I apply the curve’s effect only in this area, painting in white over the black mask. I’ve used a little brush and light opacity. You can use the form at the bottom of this page to contact me. ma perchè il corso di ps la prossima volta non lo fai tu???? troppo buono ;) …ma la trovo una proposta alquanto avventata!! don’t quit and also keep posting due to the fact it simply good worth to look through it. impatient to browse through way more of your current content articles, have a good day! Very helpful and very well explained. Thank You for that Andrea!